Help small business get online, drive new business to their sites and take advantage of new eBusiness technologies. The internet is becoming a number one place to find local businesses, and those who take advantage of this are quickly becoming the go to choice for consumers. With Gogiro, businesses can get online and have a complete, result driven eMarketing strategy executed for less than $60 /m. Gogiro is offering entrepreneurs an exclusive joint-venture opportunity to open a regional Gogiro office with the Master Distribution rights to the entire state. There is no technical experience required, only the ability to manage incoming leads, consult with small businesses over the phone and service the regional client base. 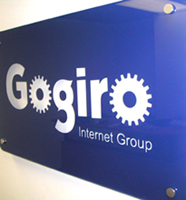 Gogiro's corporate team fulfills all sales orders and manages the entire technical infrastructure. Each office is fully supported and includes a start-up marketing program and an on-going opt-in lead generation service. With only 250 total sales, earn a personal net profit of $102,500 with a residual annual income of $75,000. With each territory protected, no other Business License is available within the same territory. Your business is independent: you can build equity from day one, secure a quick return on investment, earn excellent profits, and even sell your Gogiro business in the future if you choose. As Gogiro grows, so does the equity and stake that you have in your protected area license. Our business structure can accommodate several types of growth scenarios, including multiple office portals, sub-distributor setups, customized affiliate programs and referral links. All Gogiro Business Territories are large, allowing our distributors to expand their client base and increase revenues and profits daily. The Gogiro Master Licensing program is structured to manage small, personal relationships on a massive scale – with thousands of clients throughout multiple offices. With the support and tools in place, how you choose to grow is up to you. Gogiro Partners can work virtually from anywhere in the world through a 24/7 online login. Our Virtual Office allows for automation and easy management of your most time-consuming business functions.